There aren't enough pogies to take up the slack, and Maine's strict bait rules prohibit species that could sicken another fishery, leaving state regulators pursuing other strategies. The threat of a huge cut in next year’s herring catch quota has Maine bait dealers scrambling to find alternative ways to satisfy the voracious appetite of the state’s $1.4 billion lobster industry. The New England Fishery Management Council voted last month to set the 2019 herring quota at 32.1 million pounds – about 78 million pounds less than what the East Coast herring fleet is permitted to catch this year – to help the population recover from a record-low number of juvenile herring. To put the cut in context, that is about 2,000 tractor-trailer trucks of the industry’s favorite bait that won’t be showing up in New England lobster ports next year. Some fishermen have told Tooley they aren’t worried about the bait shortage because they don’t use herring. Some have switched to pogy or rockfish because it fishes better for them, while others have weaned themselves off herring, or found ways to conserve bait use, because they saw the collapse coming. But as more fishermen look to other bait species, the prices of those species are likely to rise and their availability shrink, Tooley predicted. Recent pogy seasons have been strong, leading regulators to increase quotas and open episodic fisheries to take advantage of the unexpected surpluses, but the number of pogies landed in Maine this year – about 7 million pounds – is a drop in the bait bucket when it comes to how much Maine’s lobster industry needs at its end-of-summer peak, Tooley said. O’Hara, which is just one dealer among many, can sell that much lobster bait in August alone, she said. “Some years we get a good run and some we don’t, but even on a good year there’s not enough pogy in the Gulf of Maine to replace herring,” Tooley said. State fishing regulators say the same thing about Maine alewives, which are on the rebound now that the state is tearing down dams that blocked their spawning. Groups like The Nature Conservancy are working with lobster co-ops to see if they can freeze the spring alewives that some lobstermen use to bait traps in the spring, but regulators say there aren’t enough alewives in the Kennebec River to make a dent in Maine’s lobster bait needs. But every little bit of local bait helps, especially with price. Lobstermen fear that herring prices, which now run about $45 a bushel on the coast, will double in 2019. Bait caught on the West Coast must be transported by train and truck to Maine, which adds to its cost, Tooley said. Transportation costs go up even more when a foreign bait that must be shipped to the U.S. is considered, she said. Bait dealers know all about the herring shortage and how much the lobster industry depends on it, Tooley said. That puts lobster bait companies like O’Hara’s at a disadvantage during price negotiations. If the council’s approved herring quota stands – the National Oceanic and Atmospheric Administration can reject or amend the quota, or decide to enact it later in the year – bait dealers like O’Hara worry about what it will do to Maine’s small herring fleet. O’Hara runs two herring vessels, Sunlight and Starlight, which employ about a dozen crew members between them, some of whom have spent their entire lives fishing for herring, Tooley said. Like most New England fishing crews, the O’Hara herring fishermen earn a percentage of the catch, so when they don’t fish, they don’t earn, Tooley said. While a company like O’Hara might be able to sit out a season or two and endure the loss, its herring crew can’t afford to do that and would most likely be forced to leave the fishery, if not the state, Tooley said. Even O’Hara would eventually have to consider whether it should sell one of its herring vessels. “Even if the population bounces back, which we obviously hope it does, we may not have the fishing infrastructure left in place to land herring locally,” Tooley said. The herring industry wants Maine to seek a fishing disaster declaration from the U.S. Department of Commerce, Tooley said. Maine has sought and received such declarations before, both for the collapse of the groundfishery and the impacts of red tide. With funding from Congress, states can use disaster money to help the affected fisheries and their participants survive the disaster and even rebuild. Maine regulators know the industry is interested in a disaster declaration, and are awaiting NOAA’s final determination of the 2019 herring quota before evaluating the potential impact on the industry. The National Marine Fisheries Service generally requires at least a 35 percent revenue loss in the fishery, compared with the previous five years, to justify a determination of a commercial fishery failure. A boat unloads herring in Rockland in 2015, when they were being caught in huge amounts. 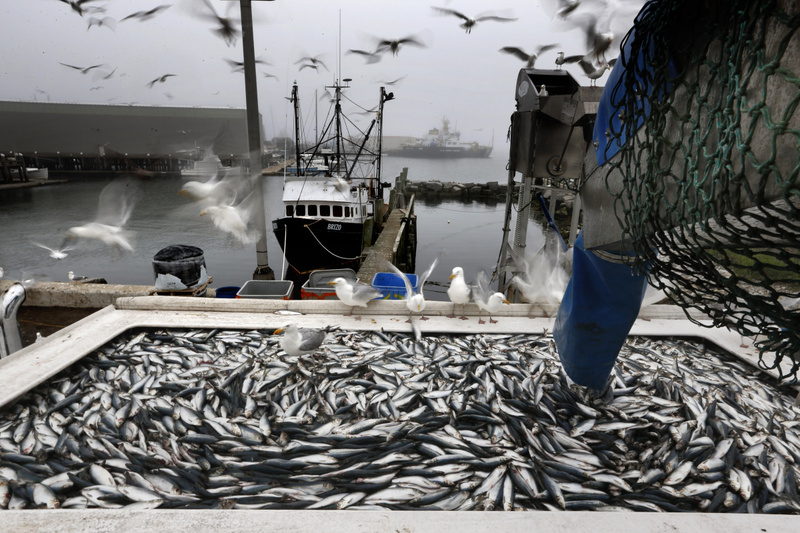 A recent survey found a record-low number of juvenile herring. For the herring industry, which over the past five years was valued at about $27.9 million a year, that commercial fishery threshold means the industry would have to take at least a $9.8 million hit in 2019. Industry representatives wave that requirement off, saying that a 78 million-pound decline in quota would result in a much bigger financial hit than that, no matter what high prices herring might fetch next year. With the most popular bait in short supply, and what is available likely to be double the price, Maine regulators are worried about what lobstermen might be tempted to use for bait instead of herring. Maine has strict bait safety rules, with fishermen prohibited from using any bait species that isn’t on a pre-approved list to minimize the risk of introducing a dangerous pathogen into state waters that could tear through another fishery, like shrimp, crab, river herring or even lobster. 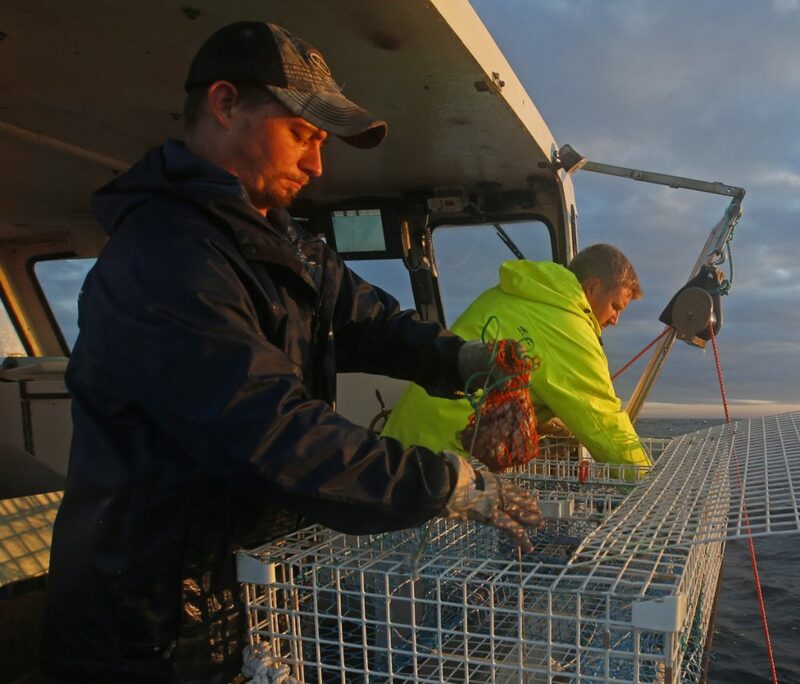 Some lobstermen want the state Department of Marine Resources to relax its bait rules to help expand the array of affordable replacements for herring that will be available to feed the Maine lobster industry next year and fill that 78 million-pound bait deficit. They argue that no other state regulates what their fishermen use to bait their traps. Boats from Massachusetts, New Hampshire and Canada use bait that Maine fishermen can’t right here in the Gulf of Maine, they say. But fishermen shouldn’t count on salmon racks – the discarded, fleshed head and skeleton left over after a salmon is filleted – or any other prohibited species of exotic bait fish to fill next year’s projected herring gap, said Marine Resources Commissioner Patrick Keliher. Instead of easing Maine’s bait rules, Keliher is asking interstate fishing regulators to apply Maine’s bait rules across New England. He realizes this could actually make the bait crunch a little tighter by forcing all lobstermen, not just those from Maine, to scramble for the same limited bait supply. But Keliher said increased competition is a small price to pay to protect Maine’s signature brand, as well as the lobster industry as a whole. He thinks the herring quota will bounce back in a few years, once a big upcoming generation of fish reach spawning age, but a disease outbreak in the lobster industry could hurt for decades. Maine enacted its bait safety regulations in 2013 after the DMR learned that farmed Vietnamese catfish, which are known as a carrier of white spot disease, and Asian carp from the U.S. Midwest, which are known to carry viral hemorrhagic septicemia, had been reported among the millions of pounds of lobster bait being imported for use in Maine’s most lucrative fishery, Keliher said. Under the law, Maine set up a fish health technical committee made up of government, academic and private-industry aquatic animal health professionals that can review new baits to see if they pose a threat to the Maine ecosystem. The committee added four species, such as the Patagonian toothfish, to the allowed bait list in July, for example. In other cases, the committee agreed to grant one-time exceptions to carp bait shipments that tested free of pathogens. The department is concerned that its small staff and committee of volunteers will be deluged with bait review requests next year, leaving the agency unable to give each bait a thorough review in a timely manner. The department cannot charge a fee for the review. It is considering whether to require bait dealers to obtain a risk analysis from a qualified professional that can then be reviewed by the committee and commissioner. Correction: This story was updated at 1:20 p.m. Friday, Dec. 7, 2018, to correct the amount of the herring quota.